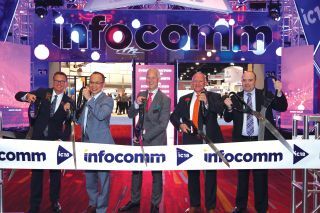 With one collective snip of five giant scissors, AVIXA’s Board of Directors welcomed a large crowd of anxious attendees to begin their InfoComm exhibits experience Wednesday morning. After spending Tuesday investigating impactful technologies at educational programs such as TIDE, Integrated Life Day and Emerging Trends Day, AVIXA members were able to walk the show floor to experience them for themselves. For an InfoComm attendee, a positive user experience can include witnessing new technologies and partaking in conference sessions, but AVIXA CEO David Labuskes, CTS, CAE, RCDD, is quick to emphasize another important aspect of the InfoComm experience.